Take some time this week to remember your original happy hour: Saturday mornings as a kid, waking up at dawn, jumping on the couch with a bowl of chocolate cereal, turning on the ‘toons, tuning out the outside world, and working your way into a sugar hangover before noon. This Saturday morning we bring our very first hostful episode wherein Grim Shea, Marke., and our good friend Johnny Heck come to bury 2016, not to praise it. Why no guests this time? Why, because we are good hosts that only want to bring joy into the world — and since 2016 was generally craptacular with just a scant few fine moments, we decided to get on with the stages of grief and put it all behind us. 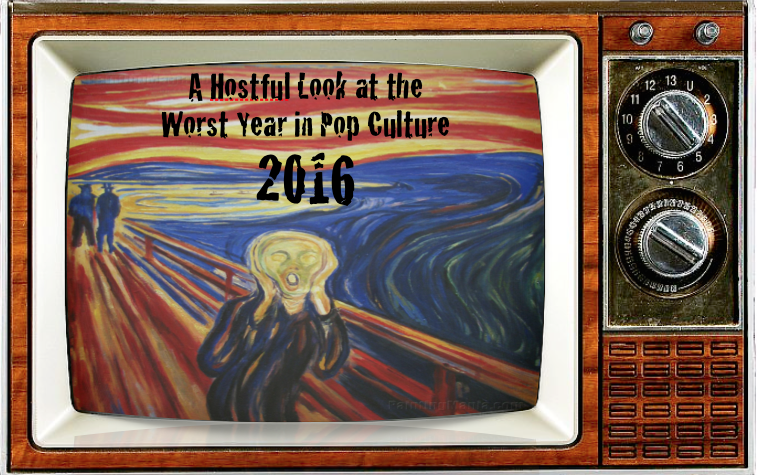 We chat with bitter wistfulness about some of the movies, television, conventions, personalities, and pop culture that helped make 2016 into, well, an entire 365 days. Join us in remembering, and then begin forgetting! Hosted by Grim Shea, Marke. and the unceremonious return of Johnny Heck!